Writing a detective story in a science fiction or fantasy setting can be a hazardous undertaking because of the temptation for the writer to cheat by having his hero pull out some gadget that will destroy the suspect’s alibi by showing everyplace he’s been for the last twenty-four hours or casting a magic spell that shows the blood on his hands, literal or not. In order for the mystery writer to play fair with the readers and write a whodunit worth reading, he has to set out the rules and limitations of the advanced technology or magic that his world uses to solve crimes. He need not make the rules explicit in the story, but they have to be there in the background, and they have to be reasonably consistent. Randall Garrett did an excellent job of combining the mystery and fantasy genres in his Lord Darcy series of stories. Set in an alternate world in which Richard the Lion Hearted managed to survive the accidental crossbow shot that killed in real life. Instead, the near death experience prompted King Richard to settle down from fighting and crusading and seriously try to govern the lands he ruled, resulting in an Angevin Empire that survives into the twentieth century. Richard also patronised scholars and scientists which led to the discovery of the laws of magic. By the time of Garrett’s stories, the Angevin Empire of England and France, along with the Americas and other colonies is the leading world power and magic is used in everyday applications, much as science and technology are used in ours. Magicians can cast spells to preserve food, secure homes, communicate over long distances, and help solve crimes. In this world, Lord Darcy is the Chief Forensic Investigator for the Duke of Normandy. In the course of his duties, Lord Darcy solves crimes and untangles international intrigues, assisted by the forensic sorcerer Sean O’ Lochlainn. Despite the fantasy setting, the cases Lord Darcy investigates are mostly the sort that can be found in any mystery story. Magic is not often used to commit the crimes and Sean O’Lochlainn’s techniques are rather like the more scientific procedures that might be familiar to a viewer of a show like CSI. Magic is a substitute for science in Lord Darcy’s world and a forensic sorcerer can no more solve a crime by magic in that world than a crime scene technician can “magically” solve a crime in our own. 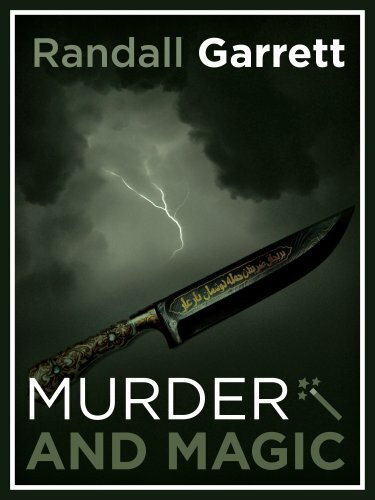 Murder and Magic is Randall Garrett’s first collection of Lord Darcy stories. The collection includes four short stories with cases involving a supposed suicide, mistaken identities and blackmail, and a plot by the King of Poland, England-France’s chief international rival, to disrupt the Atlantic trade. I found each of the stories to be entertaining and finished the book wanting to read more. I think that anyone who enjoys reading either mysteries or fantasies will find the stories that combine the two genres to be worth reading.